Candida Albicans is a strain of yeast that occurs naturally in the digestive tracts of humans. In low amounts, it coexists with a diverse array of other microorganisms to make up the gut microbiome. When certain conditions allow candida to proliferate, problems can occur. It makes its home within the mucous membranes of the intestinal tract. When an overgrowth occurs, it can compromise this fragile barrier and make its way into the bloodstream (1, 2). 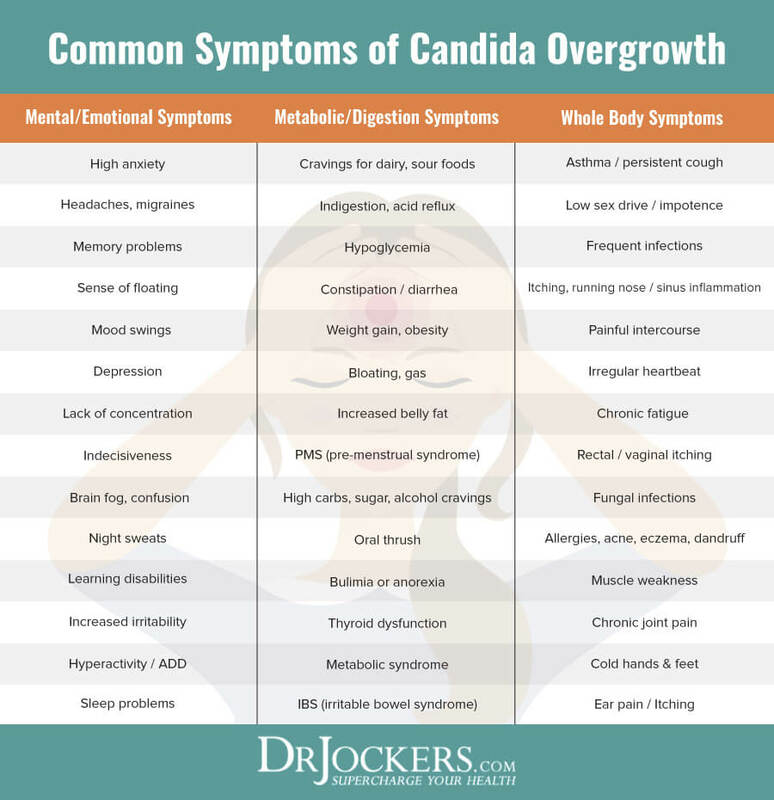 In this article we are going to cover causes, symptoms, natural herbs and supplements that you can use to overcome candida overgrowth. Something else to keep in mind is that candida albicans can be passed through sexual contact so if you have a partner, you should both follow a similar protocol for a period of time to avoid persistent reinfection. Candida albicans overgrowth is toxic to the body for many reasons. This yeast can emit over 70 different toxins which can make their way into the blood stream (3). These toxins create chronic inflammatory immune activity and place a heavy toxic load on the liver. If this goes on long enough, chronic inflammatory activity and overactive immune response can set you up for autoimmune conditions like hypothyroidism, arthritis, or lupus. The following are two primary toxins of concern. Acetaldehyde:This is a byproduct of candida albicans as it feeds and grows. High levels of acetaldehyde are toxic to the body and cause DNA damage. This may contribute to an increased risk of cancer (4, 5, 6). Acetaldehyde is also a byproduct of alcohol consumption. 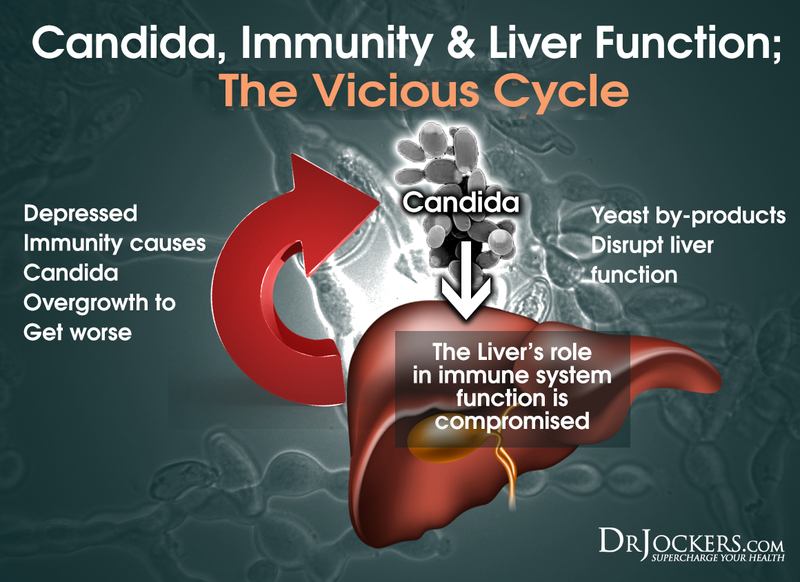 This is likely why some people often report feeling “drunk” all the time when they have a particularly bad case of candida overgrowth. Gliotoxin: Another toxin produced by Candida Albicans suppresses the immune system and impairs liver detoxification (7, 8). This creates conditions to protect and enhance candida growth even more. Once this yeast forms a protective mucosal lining, called a biofilm, these toxins are found in higher levels. Just 2 out the 70+ toxins from candida albicans have profound negative effects on the body. 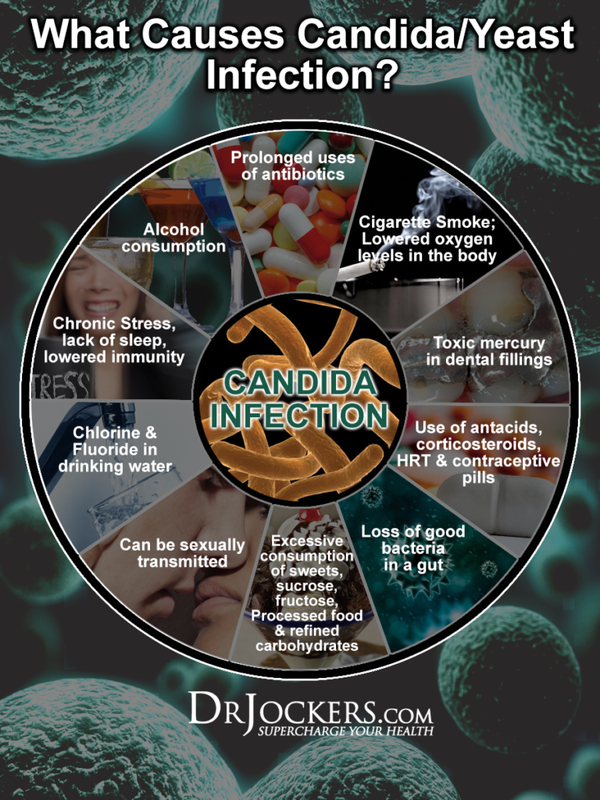 Using a thorough candida protocol can help to mitigate these effects. The further it progresses, the more symptoms candida albicans can elicit. These symptoms range from mental/emotional to metabolic or digestive – and even span out to negatively impact the entire body. Symptoms are more minor issues that occur as a result of Candida albicans overgrowth. Complications are more of a secondary health condition that can manifest as a result of chronic infection. The combination of liver burden and chronic inflammation often lead to destruction of the gut and eventually autoimmune diseases (9). At this point, a much more thorough approach is needed to support the body in healing. It is extremely common that when I work with someone who has a thyroid condition, arthritis, lupus, or any number of autoimmune-related diseases – they almost always have gut issues. When leaky gut occurs due to chronic candida albicans overgrowth, a flood of toxins and undigested food particles make their way into the blood stream. This over-activates the immune system, leading to many of these autoimmune conditions. 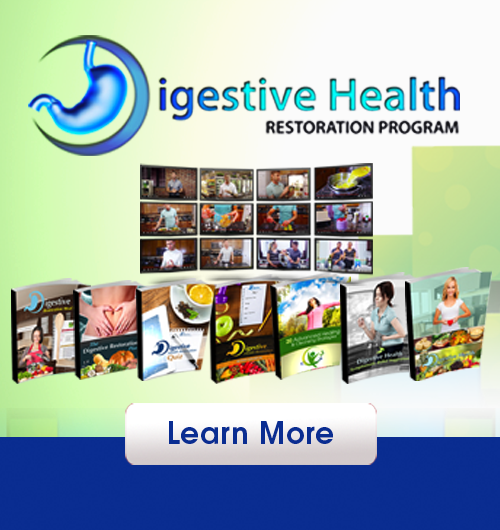 General digestive upset is super common in those with chronic candida overgrowth. On top of this, studies have actually shown that those with higher levels of candida overgrowth suffer from higher instances of inflammatory bowel diseases such as ulcerative colitis and Crohn’s disease (10). Additionally, candida albicans can lead to alterations in the gut and brain that contribute to irritability, mood swings, anxiety, and depression. Extreme brain fog can also contribute to attention deficit disorders. Candida is a naturally occurring flora of the human microbiome. Certain influences from the environment can proliferate its growth to the point where it overpopulates and begins causing the problems mentioned above. NOTE: If you have already discovered that you have candida, skip ahead to read about the best herbs and supplements you can use to combat it. I am going to briefly cover some of these testing methods in this article. 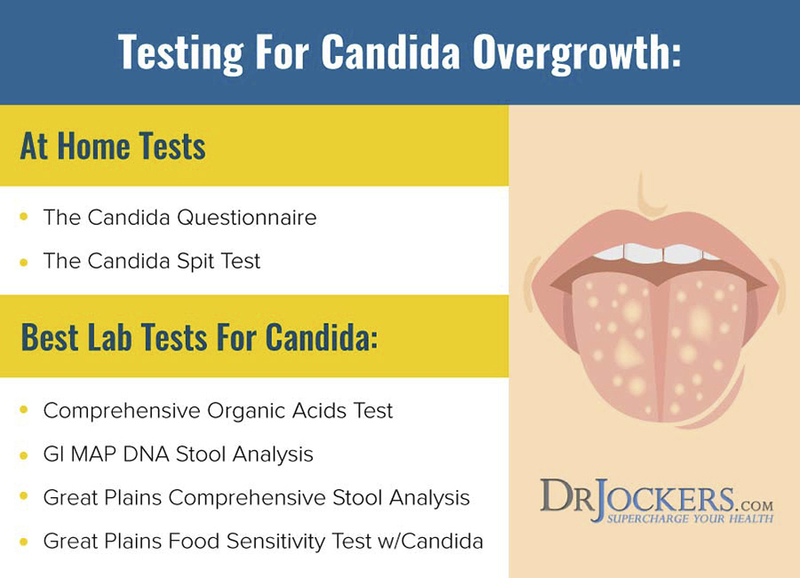 Two home tests exist for a quick, low-cost, assessment of whether or not you have candida overgrowth. The issue with these tests is that there is a high risk for false positives or negatives. Upon waking, before consuming anything or brushing your teeth, spit into a clean glass of water. -Stays at the top and you see thin strands that look like strings or spider legs extending downward. -Floats to the bottom and looks cloudy. -Suspended in the water and looks like little specs are floating. The other option for a home assessment is the Candida Questionnaire found in this article here. The Organic Acids test is a urine analysis that is able to detect byproducts of different processes in the body. For example, when the liver processes a toxin, it is converted into a particular byproduct and sent for excretion through a few different pathways, one of which is the urine. By analyzing different compounds in the urine, we get an idea of what is going on inside the body. The Organic Acids Test has several markers for yeast and fungal overgrowth which will become elevated in instances of candida albicans overgrowth. This lab is cost effective for detecting a number of other things going on in the body. The downfall is that is does not specifically analyze the stool for the extent of candida overgrowth in the actual digestive tract. The GI MAP stool analysis is a lab that directly observes the microbial balance of your stool. By observing the microbial and chemical balance of the stool, we get a good idea of what is going on inside the gut. The GI MAP specifically is one of the most comprehensive stool analysis tools currently available. In addition to candida albicans, it also is able to detect for a number of other microbial species like viruses, parasites, opportunistic bacteria, and even markers of inflammation. Sometimes addressing candida alone doesn’t work because there are a number of infections going on simultaneously. Okay, now it is time to create a plan. It is one thing to just take anti-microbials and hope it helps – my intention is to help you create a comprehensive plan to attack this thing head on. 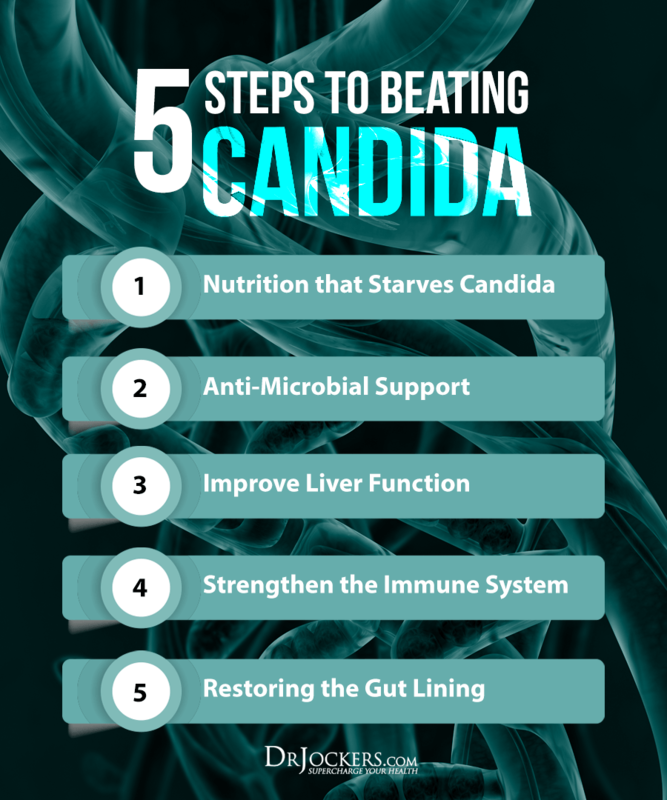 The following steps are critical for making sure you take care of this Candida Albicans overgrowth once and for all. Natural Anti-Microbials: A combination of anti-microbial herbs, enzymes, probiotics, and binders will likely be needed to address the infection without suffering harsh die off side effects. Support the Liver: The liver will need extra support during the healing process to get rid of die off byproducts. Strengthen the Immune System: Taking steps to boost the immune system will help to fight off any residual candida that has made its way into the blood stream. Heal the Gut Lining: Healing the gut is critical for long-term success. We don’t want any more candida or undigested food getting into the blood stream and over-activating the immune system. The following list is comprised of some of the most effective compounds I have found clinically in regards to addressing candida albicans. They demonstrate a remarkable ability to inhibit the growth of not just candida, but a number of other unwanted visitors in the gut. Using them as outlined in my personal protocol at the bottom of this article will help to ensure your infection is addressed as thoroughly as possible. Oregon Grape root contains a plant alkaloid called berberine. Berberine has been shown in research to combat candida albicans by disrupting the cellular membrane (11). Berberine has demonstrated broad-range antimicrobial activity against a multitude of human pathogens. Additionally, berberine is great for stabilizing blood sugar. During the initial stages of addressing candida, it is possible that sugar cravings will increase temporarily. Using berberine may be able to help with this side effect. Grapefruit seed is full of antioxidant bioflavonoids. One in particular, called hesperidin, is great for both boosting the immune system and anti-microbial activity. A study in The Journal of Alternative and Complementary Medicine found that this powerful extract was able to kill over 800 bacterial and viral strains, 100 strains of fungus, and many types of parasites (12). 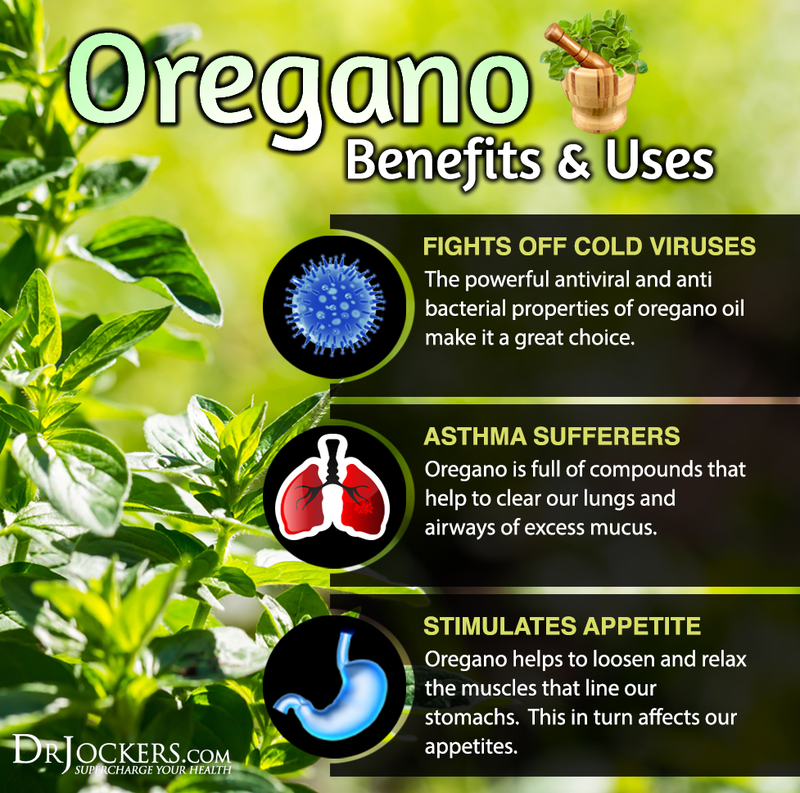 Oregano is an extremely potent tool against bacteria, viruses, parasites, and fungi. It has even been shown in research to help combat anti-biotic resistant MRSA (13). Oregano is also a powerful source of antioxidants along with other Italian herbs like basil and thyme (which also have anti-microbial activity)! Ginger can be helpful in the case of candida for several reasons. It is tremendously anti-inflammatory for the gut and can assist with many of the digestive complaints encountered with candida albicans overgrowth. 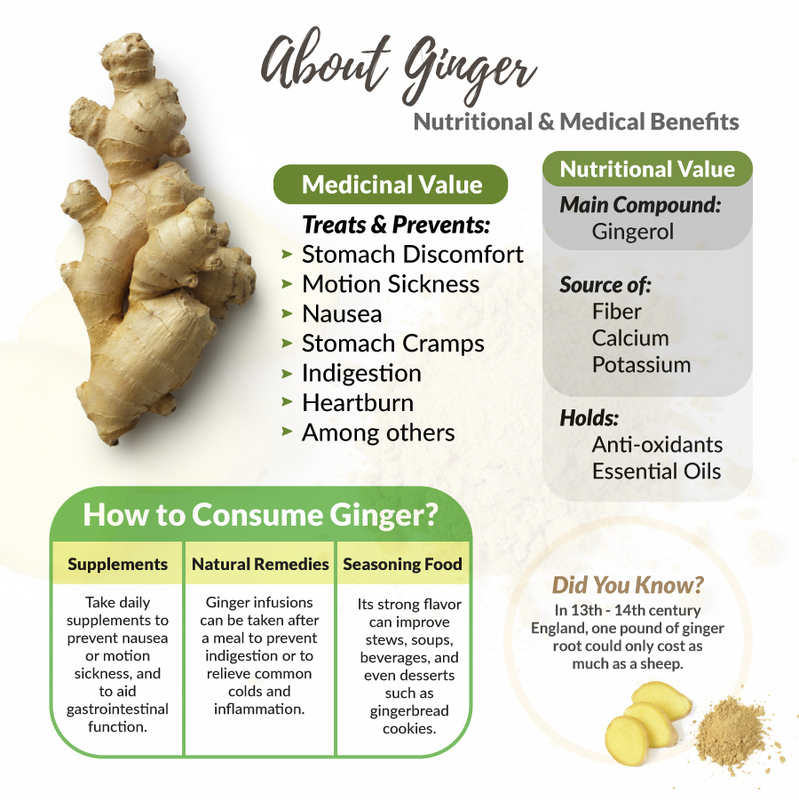 In addition to helping sooth inflammation and improving digestive upset, ginger actually has antifungal activity as well. For this combination of benefits, it is critical for including in your healing plan. Turmeric, similar to ginger, is another powerful anti-inflammatory spice. Turmeric is excellent for upregulating detoxification in the liver and even disrupting microbial biofilms in the digestive tract. The biofilm is a protective barrier that things like candida create to prevent being expelled. Using turmeric and some of the upcoming compounds is critical for disrupting this biofilm so the antimicrobials can really do their job. Olive leaf extract has demonstrated antifungal effects towards candida albicans in addition to having powerful antiviral and immune boosting benefits. In fact, on of my go-to formulas for candida, Candida Elim, combines olive leaf extract with oregano, ginger, turmeric, and sodium caprylate which combine to fight candida and GI inflammation. This is one tool of many which I would recommend in the case of candida. Bacteriophages are a key component of our mucous membranes in the gut that help to regulate and balance different flora. What is unique about these organisms is that they infect and use bacteria as a means of replication. Different types of phages are known for targeting specific species of bacteria. Certain products like Candida Combat use phages as a combination with antimicrobial herbs and fermented botanicals to provide an overall balancing effect to the microbiome. When employing antimicrobials to address candida overgrowth, it can be helpful to also use probiotics to assist with the restoration of healthy gut flora. These flora will then have the opportunity to repopulate and provide a defense against a recurring candida albicans growth. You will see that this is a key part of my candida protocol. As has been mentioned a few times already in this article, candida has a tendency to develop a biofilm that protects itself within the gut. Breaking down this biofilm is an important part of getting rid of it fully. In addition to some of the herbs mentioned so far, proteolytic enzymes are excellent for breaking down biofilms. One enzyme in particular, serrapeptidase, is great for breaking through biofilm so that the other antimicrobial herbs can reach the candida albicans overgrowth. If you are going to target candida albicans, there will be some level of toxic waste that is released during the die-off. Depending on the extent of your infection and your detoxification abilities, you may or may not experience symptoms of die off. Regardless, I always recommend using activated charcoal during this process to bind to toxins in the gut and help remove them before they become reabsorbed. Candida albicans is a normally occurring yeast in the digestive tract of humans. A number of different factors can throw off the normal balance of microbes in the gut, leading to a candida overgrowth. If not addressed properly, this can lead to a number of side effects or more serious complications over time. 7. Shah DT, Jackman S, Engle J, Larsen B. Effect of gliotoxin on human polymorphonuclear neutrophils. Infectious Diseases in Obstetrics and Gynecology. 1998;6(4):168-175. I have two children with almost every symptom of candida who were given many antibiotics in infancy and as toddlers. They are now 12 and 15 and “sick” everyday with Gastrointestinal complaints, aches, itches, asthmas, etc to a degree these persistent symptoms effect their daily living and learning. They both also have dermatographia which I think is from high histamine and they take antihistamines daily for asthma and allergies. What parts of the Candida protocol would be safe for older children? It sounds like candid Elim would help them greatly. Would it be still be beneficial even without the full adult protocol? Hey Laurie, so sorry to hear about this. Using just the Candida Elim would still be helpful, the full protocol along with the gut healing protocol would probably be best – just stick with lower dosages of the supplements over about a 3 month period! Your article mentions Candida can be passed on through sexual contact. Is that still possible if you are not experiencing any Candida symptoms in your genital area? 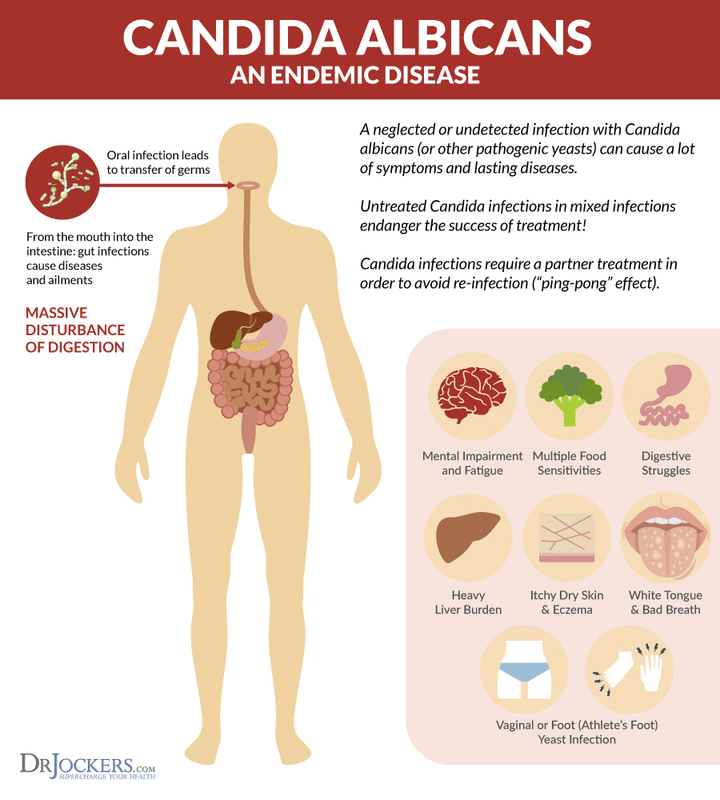 Is Candida treament the same for men and women? Thank you.